It has been seen that married couples tend to be healthier and happier apart from living longer than those that stay single. However, with divorce rate skyrocketing in the last few years, most people wonder about the magic of lasting relationships. 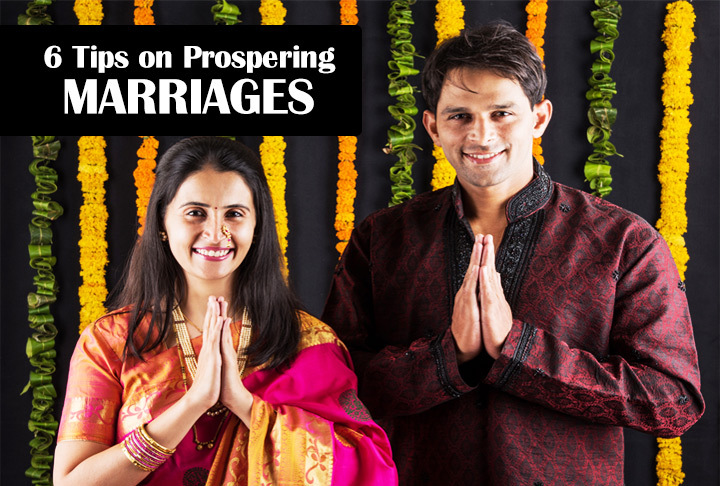 To decode the mystery, here are 6 tips on prospering marriage which when followed shall help you enjoy blissful married life. Respect: It is important to maintain respect between you and your spouse, because if you don’t respect each other, there is no appreciation of each other. Undermining the qualities of each other, leads to negativity. Togetherness: When you are a couple, it is not ‘me’ but ‘we’. You need to discuss problems, issues and everyday living and always take a decision after mutual consent. Joint finances: Don’t splurge. It is best to discuss together and ask or consult your spouse before make a major purchase. Whether it is paying bills together or buying a house, both should be equally involved in the decision making process. Truthfulness: It is best to be honest with each other. Hiding things or being untruthful creates a wedge in married life. That is why it is important to stay honest and clear about everything with each other. Fitness and healthy eating: Paying attention to your health and fitness is important. You need to look good to feel good and that goes a long way to keep the sparks alive in the marriage. Power of touch: A quick hug or kiss before you both leave for work is reclamation of your love. The power of touch is strong and keeps the weave of the marital bonding strong, with time.